There have been several big-time, but “ungettable”, rarities reported the past few days – a Brown Booby on the Grand Banks and a late report of a Lewis’s Woodpecker in Labrador!! Still, I was stunned when I received a text message from my friend Chris Ryan this morning asking me about a LAZULI BUNTING just reported on the newsgroup! WHAT?!?! Bruce Rodriguez, who works with the Division of Wildlife and has bird experience from across the country, reported seeing an adult male Lazuli Bunting in his Corner Brook yard this morning – however it flew off before he could get a “decent” photo. I immediately emailed him … the description he sent me was compelling, but I had to wait for him to send me a couple photos he described as “dark” and “just a blur”. When he did, a lightened version of his dark photo (below) showed a bird that almost certainly is a LAZULI BUNTING!!! This apparent adult male LAZULI BUNTING was photographed in Corner Brook this morning – if confirmed (and this photo pretty much does that), it would mark the first record of this western species for Newfoundland & Labrador!! WOW!!! Lazuli Buntings occur across the western half of the United States and the southernmost regions of British Columbia, Alberta and Manitoba; wintering primarily in western Mexico. While not completely unprecedented in the northeast, it is a major league rarity in these parts and the first for Newfoundland & Labrador. Bruce watched in futility as the bird flew out of his yard, moved through several neighbour’s properties and eventually out of sight. Hopefully it will return … Bruce is stocking his feeders as I write this! Personally, I’m stranded in St. John’s with family obligations the next few days, but with a rarity like this I’ll be aching to go chase it the first chance I get!! This entry was posted in Uncategorized and tagged Lazuli Bunting, Newfoundland, Passerina amoena, rare bird. Bookmark the permalink. Wow! 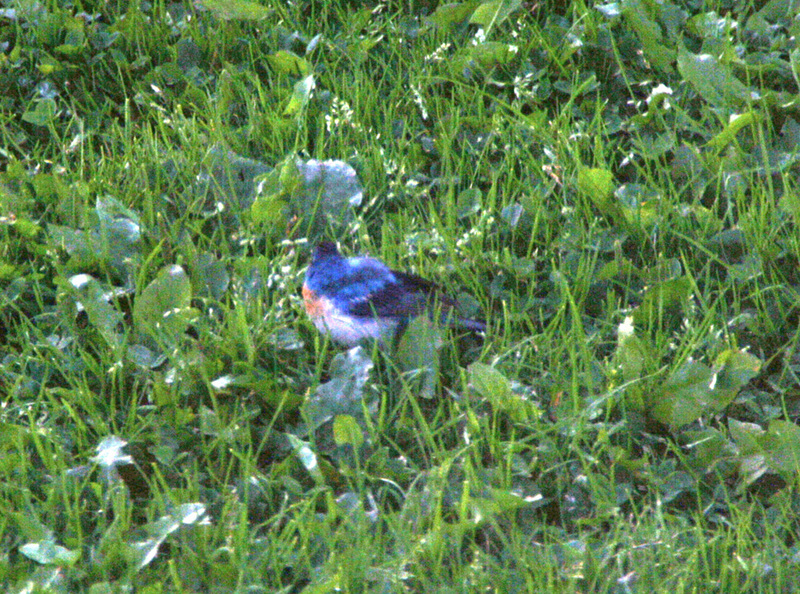 A Lazuli Bunting in Newfoundland! !